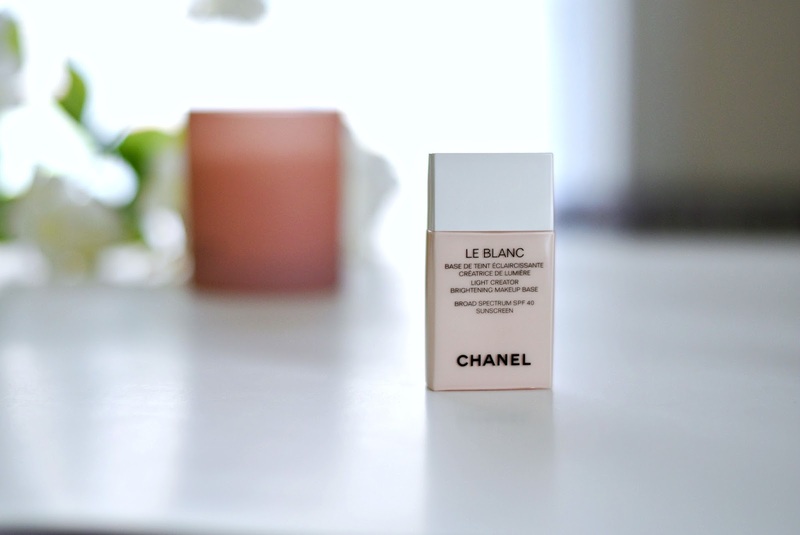 Happy Wednesday lovelies, After a little breack I'm back to blogging and I want to show you guys this Chanel Le Blanc Light Creator Brightening Makeup Base SPF 40 . You may remember I was so disapointed with Smashbox Photo Finish Foundation Primer (you can read about it __ Here) and I'm so happy I found one that I can at least, use. It's probably not the best primer on the market but with the proper foundation it can work . "Now enriched with SPF 40, this lightweight, oil-free formula enhances radiance and extends the wear of foundation for an all-day rosy glow. A new yellow-based shade, Mimosa, provides sheer coverage to help visibly correct the appearance of shadows and unevenness." This Chanel Le Blanc primer is a somewhat watery, light pink fluid that mede me quite worried that I couldn't use it properly, but it's actually quite easy to apply. 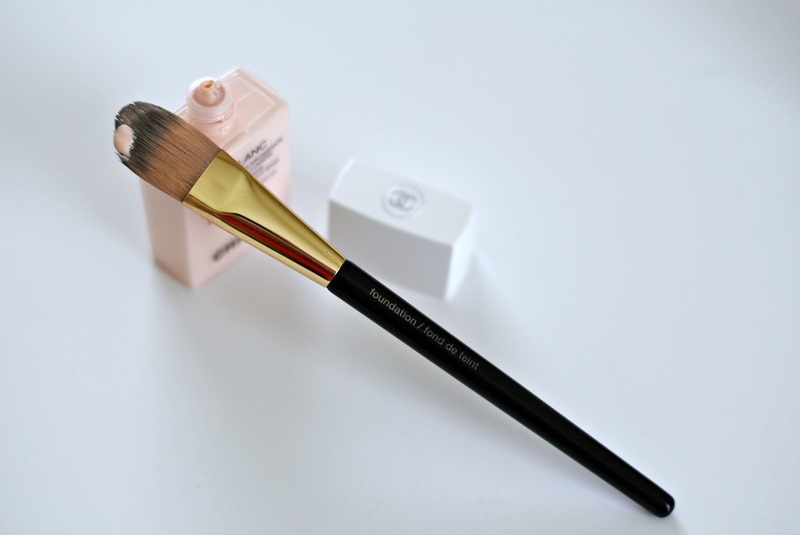 I use my foundation brush to apply it and let it sit for few minutes before I apply my liquid foundation. This Chanel primer evens out the skin and gives it nice glow. Make sure you will shake up the bottle prior to application. I can't say much about oily skin, but if you have dry skin, don't use a full-coverage liquid foundation on top of this primer otherwise it will look too heavy, for the best result, you sould apply a light to medium coverage foundation. I use this Chanel Le Blanc foundation base as a sunscreen/primer all over my face and also, you can use it as a highlighter too. So, What I love about this Chanel Le Blanc Light Creator Brightening Makeup Base SPF 40 Sunscreen? What I don't like? __ it might look heavy if you don't use the right foundation on top of it, so it's kinda treacky. and of course __ the price. Have you used this Chanel primer? Let me know in the comments below and have a lovely day. Great review!! Thanks for sharing! Love that it's lightweight and has spf 40! Thanks for sharing your review! Sounds like a great primer! I love that this primer had SPF in it, which is a must for me since I have such fair skin! Thanks for sharing!! This cream looks really nice! Thanks for the review! Glad you were able to find something you like! I've never heard of this, but then again I have super oily skin! Awesome review! I will definitely try this product. Chanel always offers top quality products! Thanks for sharing. great review! Have a great day, Loves!! Mmm... first of all, nice that you are back, happy June! Second, I read your review and you really like Chanel Le Blanc... I have it, but I didn't really feel all you did... so maybe I am wrong, will give it another try! Thanks for that, it's good to try something again! Thanks dear Denise, you are always so sweet. Honestly when I first used this Chanel base I didn't like it , second time I applied very little amount of it and feel in love with it. I guess, it's important to use only a little bit of it to make a super thin layer before a liquid foundation. You can also try apply it with your finger, instead of a brush. I hope this will help. Have a lovely day. Sounds amazing! I love Chanel products! I love trying out new primers and I definitely need to wear one because I have horrible dry skin so this one sounds like it would be perfect for my skin type. Thanks for the review. Wow ,spf 40 , that works for me especially now we are in summer time. This sounds like a great product by chanel. Thanks for reviewing . Yeah the price is a bit of a downer, but sometimes I realise things can be worth it! It looks like a good product! Sounds like lots of great reasons to give it a try, however I still find it a bit pricy. Unfortunaltly it is pricey. I agree . I need it in My life!!! SPF 40? Yes please!!! If only this was not sooooo expensive!! It sounds just like what I'm looking for! Thanks for the info! this sounds amazing! i really want to give this a try ! This Chanel primer seems great! It is a good invertment, I would say. If it works, then it works...I know Chanel products are always a bit pricy but when we find something that really works well for our skin, why not give it a try? Sometimes it is better to buy less but of better quality. I've heard such great things about both Chanel's makeup and skin care products and the only complaint I ever really hear is the price! Which, if it's doing a great job, you may not necessarily mind spending more than you would with a brand that doesn't fully deliver. The primer sounds great, I'll have to look into it! Thanks so much for sharing, beautiful, and I hope you're having a great week so far! I love that this has SPF 40- so important! Such a great review! I love CHANEL products and I definitely need to check this out! I'm on the market for a good primer. I have a combination skin so I still haven't found one that would do the trick. Wow, thanks for this informative post. I've been looking into primers lately, with the hope of getting a new one. I'll be sure to check this out. I know I should use a primer, but haven't been, so I love this review. Great stuff!